Horace Horsecollar Photo by Leigh Caldwell, "Theme Park Mom"
Walt Disney World is magical enough for families at any time of the year. 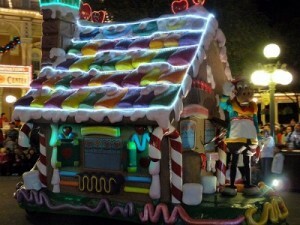 But combine the magic of Disney with the magic of Christmas and you’ve got a guaranteed trip to fantasy land. Walt Disney World Resort‘s Holiday Events for 2010 include the Candlelight Processional (held nightly at the American Gardens Theatre in Epcot theme park as part of Holidays Around the World), the Osborne Family Spectacle of Dancing Lights (featuring millions of holiday lights perfectly synchronized to music), Mickey’s Jingle Jungle Parade (held in Animal Kingdom theme park), Festival of the Seasons (including a fantastic photo-op with Santa himself), and my all-time favorite, Mickey’s Very Merry Christmas Party. Goofy drives by Leigh Caldwell, "Theme Park Mom"
Mickey’s Very Merry Christmas Party is a special event held each winter on select nights at Magic Kingdom theme park. 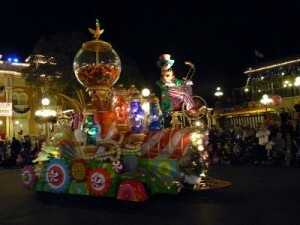 Purchase of an additional event ticket is required, but the price is well worth it, as the Party includes jolly holiday parades filled with the beloved Disney characters, fireworks, and live entertainment. * A magical snowfall on Main Street, U.S.A. Many of the most popular Magic Kingdom attractions stay open during the Party, and you can often avoid waiting in lines, as regular guests have cleared out of the park. Only holders of Mickey’s Very Merry Christmas Party passes are allowed to stay and play! Also, if you have small children who have their hearts set on seeing their favorite Disney characters, the lines for photos and autographs will be much shorter at Mickey’s Very Merry Christmas Party than they are during the day. There’s nothing that can get a family in the Christmas spirit faster than a visit to Walt Disney World Resort at Christmastime. Disney always does wonderful effects with lighting at their resort properties and theme parks, and Walt Disney World Resort shines like a magic lantern filled with pixie dust during the holiday season.